The Glorious 50s & 60s – Until the 1950s, the lodging industry in Greece consisted almost entirely of hotels situated in urban centers and resorts near the principal vacation destinations like Corfu or Rhodes. In 1950, the Greek National Tourism Organization began the Xenia program to construct and operate hotels across the country. The Xenia resort hotels were located in coastal and mainland areas which had unique scenery, allowing these properties to be marketed as tourist destinations. The buildings were designed by a team under Aris Konstantinidis, a notable architect of modernism in Greece, and were icons of Greek modernist architecture. The project was completed in 1974 and officially terminated in 1983, the hotels were given over to private operators or eventually sold off, meanwhile many private hotel projects in Greece were inspired by the Xenia resorts. Xenia Motel at Meteora by Aris Konstantinidis (1960). Photo source: tourismlandscapes. 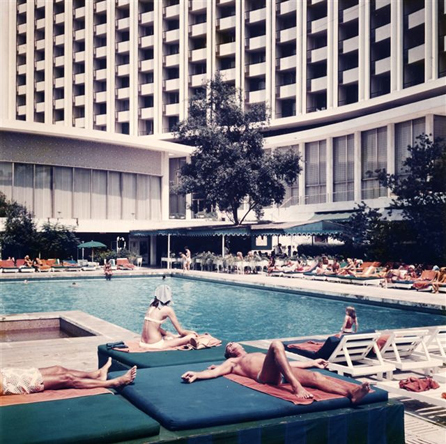 Greece’s first international chain hotel, the Hilton Athens, opened in 1963. The Hilton was a building of an unprecedented size and innovative services. The initial design for the building was put together by a team of Greek architects consisted of Emmanuel Vourecas, Procopius Vassiliades, Spyros Staicos and Anthony Georgiades. The exterior was defined by a gleaming white marble slab decorated with a relief by Yannis Moralis (one of the most important 20th-century Greek artists), a stripped down façade of equally-sized balconies, and utilitarian simplicity. The interior of the hotel was a typical example of the sleek and stylish modernism of the 1960s. All these features lent the Hilton a utopian aura. The founder of the company, Conrad Hilton, who was present during the inauguration ceremony, said: “Hilton hotel in Athens is the most beautiful Hilton hotel in the world”. The Athens Hilton Hotel outdoor swimming pool. Photo source: Hilton Hotels and Resorts. Setting the Standard – The hotel chains had set the pace and standards for the industry and where soon followed by owner managed properties. In his autobiography, J.W. Marriott junior, the second-generation boss, who still runs the firm mentions that “the company’s prosperity rests on such things as our sixty-six-steps-to-clean-a-room manual”. But the chain’s supply of consistent, standardized services and facilities that have been replicated throughout the world resulted in a counter-movement inspired by consumers searching for hotels with unique or sophisticated and innovative characteristics. Boutique hotels take over the town – Boutique hotels provided a solution to the problem of impersonality and homogeneity of large hotels. The term was originally coined by Steve Rubell in 1984 when he compared the Morgans Hotel, the first hotel he and Ian Schrager owned, to a small boutique as opposed to a monolithic department store. Boutique hotels tend to place a significant focus on creating extraordinary restaurants and bars packed with locals rather than being “cross-subsidized ghettos for lonely executives”. The idea behind boutique hotels suggested that hotels could target customers based on their interests rather than their income. The backlash against uniformity meant that designers could take more risks. During the last decade there were a lot of upscale hotels designed with excess in mind, design for design’s sake. Design is of course important but customers are just as interested in good service and a good room as they are in style. They should feel the excitement of a multidimensional experience that lasts beyond the initial impact. Establishing the unique selling points (USPs) – Every hotel needs to discover what is unique about its brand, what type of travelers it wants to attract and what does it offer. The more focused the answer to this question, the more clear the way to meet the customers’ needs and wants. Guests are looking for great comfort and amenities from their hotel but oftentimes they are also looking for authentic cultural experiences and face-to-face interaction with societies. The Imaret hotel in the town of Kavala in Northern Greece is housed in a 19th century Ottoman religious complex, which included a mosque, a school and soup kitchens. Photo source: Luxury Travel Magazine. Bringing back old values to market new concepts – The local environment is perhaps the only component of a hotel’s identity that cannot be reproduced and repackaged elsewhere. Greek hotels should provide unique experiences by offering their guests the chance to discover the local flavors, explore the surrounding area, delve into the local culture and blend in with the locals. This can be achieved if hoteliers direct some of their efforts into carving out spaces for visitors and their local counterparts to interact. Cultural events such as art exhibitions held in a hotel’s public spaces could attract local residents making socializing in the lobbies an everyday happening ultimately bringing part of the city life inside. Greece, its people, its traditions and way of living is offering so many opportunities to transform the hotel from a place to stay or spend the night, to a work of art, a philosophy, an intervention in the society and a means of communication. About Romanos: Having completed his Architectural Degree and a Master in Architectural Design in University College in London, Romanos has worked in Athens and the internationally acclaimed Wilkinson Eyre Architects in London. Projects of his have been published in the UK, Greece and Asia. He currently works as a design team leader in Monoplan in Zurich focusing on developing new concepts in the hospitality industry. Donat, John: “Architecture of the Xenia Hotels”, World architecture, Volume 3, 1966. p. 145. Georgiadou, Zoe; Frangou, Dionisia; Marnelos, Dimitris; “Xenia hotels in Greece: a holistic design approach”, Journal of Tourism Research. Retrieved February 18, 2016. Rigopoulos, Dimitris: “Recognition at long last for Emmanuel Vourekas“, Kathimerini. Retrieved 6 February 2015. Rosner, Cheryl: “What is a boutique hotel?“, Stayful. Retrieved 6 February 2015. Skousbøll, Karin: Greek Architecture Now, 2006. pp. 128-129. Wharton, Annabel Jane: Building the Cold War: Hilton International Hotels and Modern Architecture, 2004. Wise, Michael, Z. (July 21, 2001). “The Ideological Coding Behind Hilton Hotels“, The New York Times. Retrieved October 11, 2014. A taste of America: the former Nile Hilton Hotel, The Cairo Observer, September 14, 2011.